Imagine this: you’re enjoying a weekend drive to one of your favorite destinations, and you notice your car is starting to act up. It begins rocking and shaking as the temperature gauge rises. The next thing you know, steam is emerging from under your car’s hood. Your engine has overheated. It’s the hottest time of the year, and that puts extra stress on your car’s ability to perform. 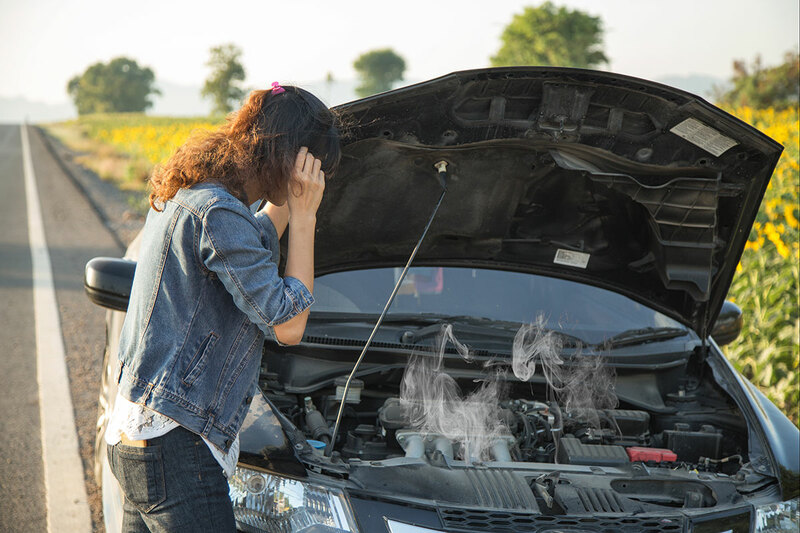 Your car’s engine is designed to work up to a certain temperature, and once that temperature is exceeded, you can run into real trouble. If something causes a cut or tear in your coolant line, it can cause your coolant to leak out. Fixing this issue requires repairing or replacing the part of the line affected. Whether as a result of mechanical failure or sediment build up, a blockage can keep your coolant from running freely. Regularly flushing your coolant lines can prevent this. The water pump is the main component of the cooling system. Without something to circulate coolant, there’s no way for it to cool off the engine. If your water pump breaks, your engine will soon overheat. A repair or replacement is required to fix this. There’s never a good time for your car to overheat. But if you recognize the signs it’s about to happen, you have a small window of time to act. Turn off the air conditioner | Your air conditioner puts extra stress on your engine. Turning it off will let it rest, helping to cool it down. Turn on the heat | Turning on the heat in your car will blow in the hot air from the engine. It isn’t the most comfortable feeling in the world, but it can save your engine from overheating. Roll down your windows | Rolling down your windows lets the hot air out of your car so that more can be pulled from the engine. Shift into neutral | If you’re stuck in a situation where traffic isn’t moving very fast, put your car into neutral when you can. This greatly cuts down on heat build up in your engine. If all else fails, pull over | If you’ve tried all the above steps and your car doesn’t show signs of improvement, make sure to pull over. That keeps you out of harm’s way and gives you somewhere to take a closer look at the problem. The best defense against overheating is preparation. Make sure your coolant is topped off during the hottest parts of the year. Regularly checking your coolant is a great habit to get into in the summer. Plus, make sure to keep an eye on your temperature gauge while you drive. While it can only warn you if your car’s about to overheat, it can give you an idea of when it’s time to add coolant. At Action Gator Tire, we believe in keeping your car in top shape all year long. That’s why when you get service with us, we top off your coolant levels to make sure you can keep driving without worry. We provide a number of services for your car, including check engine lights, air conditioning repair, and much more. Get a quote now to find out how Action Gator Tire can help you stay cool this summer.